Thousands of cultivars of Narcissus are grown for their attractive flowers, borne in spring, autumn and winter. Narcissus cyclamineus produces some of the best cultivars Narcissus ‘Tête-á-Tête’, being one, owes its petit beauty to its great parentage. 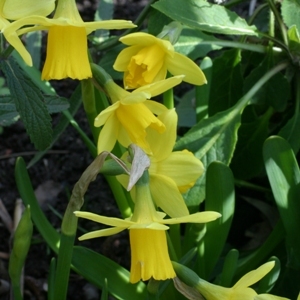 This vigorous and popular dwarf daffodil grows to 15cm (6”), bearing 1 to 3 flowers. They have deep golden yellow perianth (petal/sepal) segments with a deeper yellow cup, and strap shaped leaves. Bulbs should ideally be planted in the autumn at one and a half times their depth for flowering in spring. This is one of the most reliable, weather resistant daffodils, withstanding frost, wind and heavy rain due to its short stature. It also flowers very early, late February/March, and looks great in containers or suited to planting between shrubs in borders.